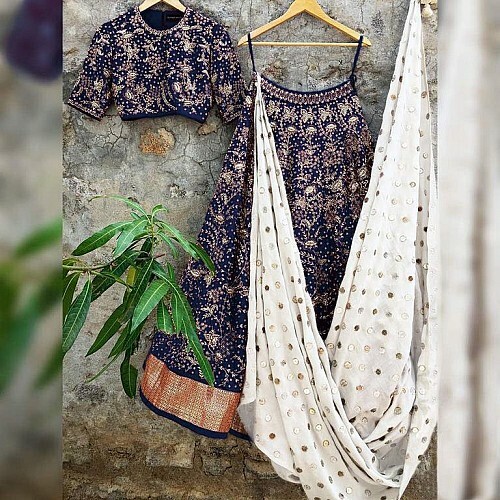 Featuring a zari work lehenga choli in navy blue art silk base. The brocade lace on th bottom gives the complete new touch to the lehenga. It comes along with matching cotton base dupatta finishing the look completely royal! Title : Navy blue Elegance Lehenga Choli With Cotton Embroidered navy blue Dupatta. Featuring a zari work lehenga choli in pink art silk base. The brocade lace on th bottom gives the complete new touch to the lehenga. It comes along w..
Blue art silk multicolored embroidered ceremonial lehenga Descritption Celebrate your close one's wedd..